Old Town Square (Dlouhá) – This is the heart of Prague’s stunning old town. The striking Gothic Church of Our Lady before Týn rises up on the far side of the square when the street view first loads. Take off in any direction. If you want a challenge, walk to the clock tower at the 14th century Old Town Hall to check out the astronomical clock, and then head south by southwest and follow the crowds towards the Charles Bridge. Every time I come to Prague, I have to walk by Gehry’s Dancing House, a once controversial and now essential addition to the city’s architectural scene. 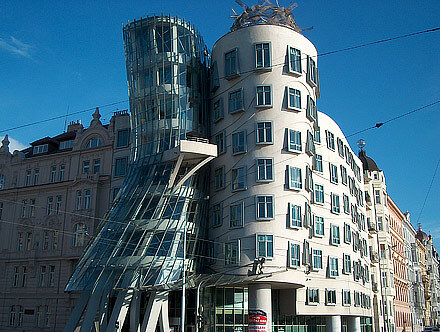 Designed along with Vlado Milunić, the two halves of this unique building literally seem to dance along the banks of the Vltava, which is why the building is also known as Fred and Ginger. As I mentioned when we visited the Disney Theater in Los Angeles, I’m a huge Gehry fan. I hope to visit all of his masterpieces one day. In the meantime, once again, fans can check out an amazing gallery of his creations at the Flicker group dedicated to his architecture. As I mentioned in the last post, Prague has not lost its artistic soul; Bohemia still very much lives up to its name. 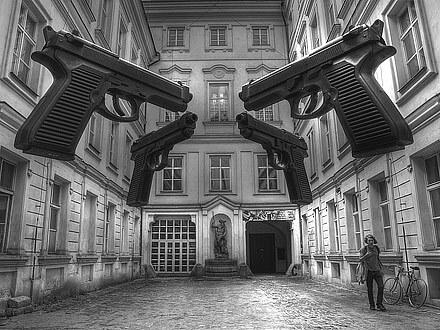 True, the once plentiful galleries devoted to Eastern Europe’s cutting edge art scene are a little thin on the ground these days and Prague’s counter-culture edge has been a tad dulled by commercial interests. And, with one small step off a plane, ContemporaryNomad.com returns to Europe. It’s a bitter-sweet return. Bitter because jungle-clad temples, isolated Himalayan monasteries, and bus-sized sharks seem so far away. Sweet because we’ve got a whole new set of adventures ahead of us here. And what better place to start than in one of my favorite cities on the planet, Prague. 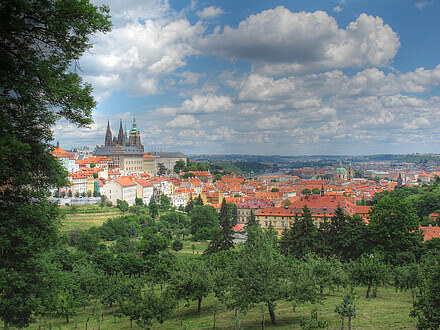 Sure, many travelers put Prague on the short list of European tourist traps. And in many ways it is. But as is the case with Paris, Venice, or Dubrovnik, it draws in the hordes because it’s simply too good to pass up. Half of humanity is compressed into a river of people flowing through the old town because the old town is simply so stunning. Every trip I make to this city (and there have been a lot of them), I discover something new. Step off into a side street, and Prague’s artistic soul is still very much present. 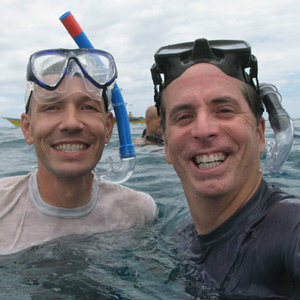 In 2007, Tony and Thomas decided to shake up their routine by traveling the globe and blogging about their adventures. Join us as we explore the world, discover its wonders, and experiment with our own version of contemporary living. More about us here.